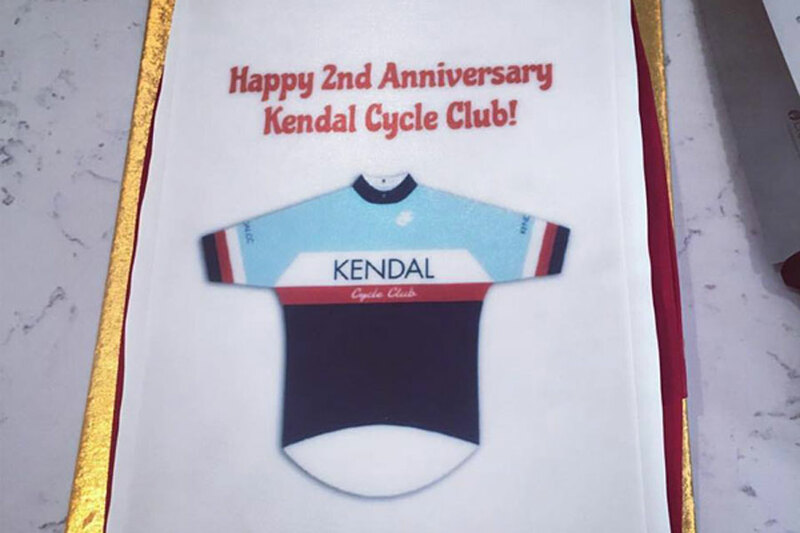 Kendal Cycle Club celebrated its 2nd anniversary on Saturday with a birthday ride attended by 93 members. Before the riders set off, club chairman Iain Childs thanked everyone for their support and enthusiasm in developing the club, and recalled the club’s inaugural ride in 2015 when just four cyclists rode together. Membership of the club recently exceed 500, which reflects the growing popularity of cycling as a way to keep fit, relax, socialise and travel, plus the inclusive nature of Kendal CC, which welcomes members of all ages and abilities. The cyclists set out on a new club route to the north of Kendal. The weekly Saturday morning club rides have traditionally headed south towards Arnside and Grange on alternative weeks, and the new option proved popular with members. Each Saturday morning groups of up to 8 riders follow routes of different lengths and speeds, from a beginners gentle “green” ride of between 10 and 15 miles through to an advanced “black” route that covers up to 50 hilly miles. Each week the club also hosts a ladies-only Breeze ride. An after-ride anniversary celebration was held at Terrazzo’s of Kendal, where a cake was cut by the youngest and eldest riders accompanied by a rousing rendition of Happy Birthday. As well as the weekly club ride, Kendal CC arranges regular road and mountain bike rides, indoor and outdoor training sessions and junior Go-Ride sessions (for ages 4 – 14). Kendal Cycle Club always welcomes new members, with an introductory ride for non-members on the first Saturday of every month.